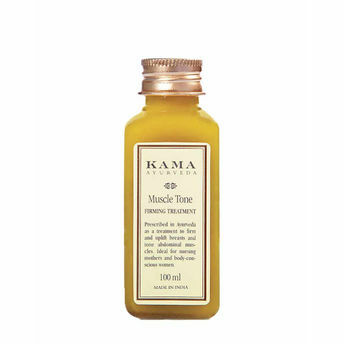 A rich, nourishing treatment for toning and firming to improve the appearance of sagging skin, stretch marks and cellulite.Kama Ayurveda's Muscle Tone Firming oil is a blend of selected herbs and oils, such as Sesame Oil, Clarified Butter, Sweet Flag, Turmeric and Lavender, which help tighten and firm muscles with regular use.Recommended to lift and firm the breasts and strengthen the abdominal muscles. Regular application also helps improve the appearance of stretch marks on the abdominal and lower back region. Can also be used by nursing mothers. Explore the entire range of Massage / Carrier Oils available on Nykaa. Shop more Kama Ayurveda products here. Explore the entire range of Anti-Cellulite Creams available on Nykaa. Shop more Kama Ayurveda products here.You can browse through the complete world of Kama Ayurveda Anti-Cellulite Creams .